Charlton manager Alan Pardew has made plain his dismay at the sale of defender Madjid Bougherra to Rangers. Bougherra joined the Glasgow club for £2.5 million, the same fee Charlton paid Sheffield Wednesday 18 months ago. 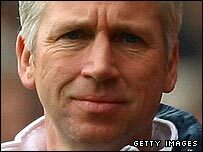 Pardew told BBC London 94.9: "It's a disappointment; you want your best players to stay. I think Madjid's only going to get better. And he said it was not his decision. "It's disappointing but you have to manage the club as the board see fit." Pardew continued: "He's a young centre-half with great technical ability and obviously very, very quick so that's a blow. We now have to make sure we're prepared for the start of the campaign." Paddy McCarthy, Ben Thatcher, Chris Powell, Marcus Bent and Chris Iwelumo have all left the Valley this summer in addition to the departure of Bougherra. Pardew said decisions have been forced upon him by circumstance. "The agenda that I was given this year was a bit of a shock to me, especially the financial situation we're in which wasn't made clear to me," he said. "It means I've had to sell three or four players that I only signed last year."